Posted on Sat, Jan 21, 2012 : 1:07 p.m.
From the White House to neighborhoods, home gardening is on the rise. This helpful graphic comes from the Mother Nature Network. 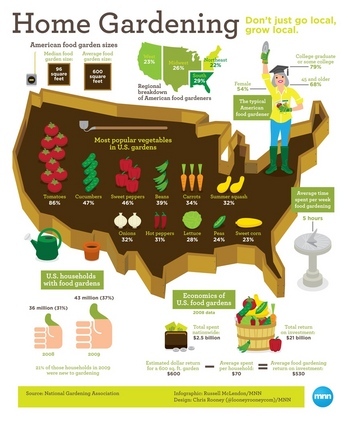 The infographic presents information from a study by the National Gardening Association, which has a great website with many resources for gardeners and a whole area devoted to gardening with kids. It's encouraging to see the increase in home gardens, just in the two years cited in the study. What's really notable is the collective economic impact of gardening. I'm not much for keeping track of how much money we save gardening, especially compared with those serious types who weigh and record all of their home produce, but I know with our way of gardening, we "earn" much more in produce than we spend in garden costs. You can read the study cited here. What are your motivations for growing your own food? Will you expand your gardens this year? What Sarah said - outstanding. Beside the reasons listed my garden is sustainable, and it is exercise. Also, I just don't want to pay allot for high quality vegetables, and I would eat less if I didn't have them myself. Mon, Jan 23, 2012 : 1:21 p.m. Almost all of the above reasons apply for me! Growing in your back yard is &quot;eating Local&quot; at its finest. You also have a lot of control over what chemicals/fertilzers/etc. go into your garden and you know what organic practices were used or not. It's also good exercise, and excuse to get outside in the sunshine, and it's a great skill to have in hard economic times.